Finally, we now have JP Rifles in the USA! We have to say that this is one of the best and cheapest A-convert kits in the market today! There are 3 models available. All come with extra barrels and free float handguards. 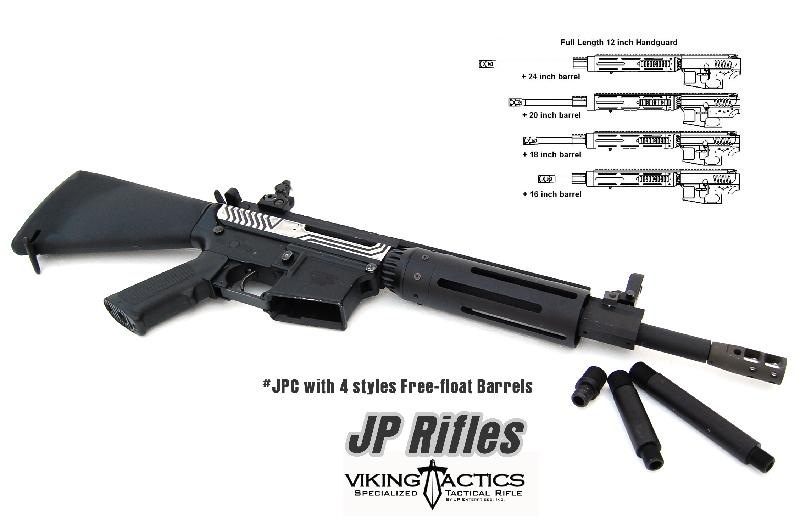 JP Full size handguard (#JPF) and JP Carbine handguard (#JPC) come with “4” different length barrels. Meaning that when you buy one model you can actually achieve four different looks! Today, we installed the 24″ barrel (#JPF) onto a full size handguard. We think that this is probably the longest M4 Sniper kit available in the market. Plus, it just downright looks good! Giving it a more modern and fancy look. About the JP Mid size handguard (JPM), we have to strongly emphasize that It only comes with one extra barrel. That means you can only achieve 2 different looks. However, the first style you have to use your original M4 barrel and keep your original front sight. The front sight will insert into the cut of the handguard in our very special design. Very similar to original dissipator style barrel designed in early 90’s.